Shall we visit a nighttime sky filled with planets and stars and birdlike spirits? What is a fantasy? A fantasy is something imaginary, something one dreams about. Does this painting look like a fantasy? Does it look like a dream? Eye-spy the different colors and shapes and textures. Do you see anything that you wonder about? Do you see any images of animals? Do you see at the top of the canvas what looks like an owl taking flight? What kind of creature do you see in the middle on the left hand side of the canvas? This creature appears to have wings that are flapping at a fast speed like a humming bird’s wings. What is he wearing? He seems to be wearing a suit of armor and a helmet on his head. He also seems to have a knife strapped to his belt and a pair of unusual shoes on his feet. Does he look like a hero in a fable or myth? How so? Make up a story about him. The artist who made this picture was inspired by the spiritual beliefs of the Yoruba people who live mostly in Nigeria. Do you know where Nigeria is? Nigeria is a country in Africa. It borders the Republic of Benin in the west, Niger in the north, Chad and Cameroon in the east, and the Gulf of Guinea on the Atlantic Ocean in the south. The Yoruba people believe in conjurers, ghosts and supernatural beings. Do these creatures look like ghosts and supernatural beings? How so? For the Yoruba, birds refer to the spiritual powers of elderly women in their community. Birds also refer to one of their beliefs that a chicken scratched the ground and created the earth. Do you wonder what materials this picture is made of? It is made of oil paint on canvas with collage. What is collage? Collage is bits of material like cloth or newspaper that are pasted onto canvas, for example, to decorate it and give it texture and further meaning. Does the texture of the collage make the images in this painting pop? Does it help to create a more vivid scene and give depth to the surface of the canvas? Describe the colors. What emotions do the colors make you feel? Do they make you feel afraid, powerful, joyful, sad? Are the colors bright or dull? Are they light or dark? Do the planes of light and dark areas interweave like a tapestry across the canvas, making the colors shimmer in intensity? What shapes do you see? Do the shapes dissolve right before your eyes? Do they look transparent? See-through? How do your eyes move across the canvas? What do you notice first? Perhaps you notice the owl-like creature first and then the creature in armor. 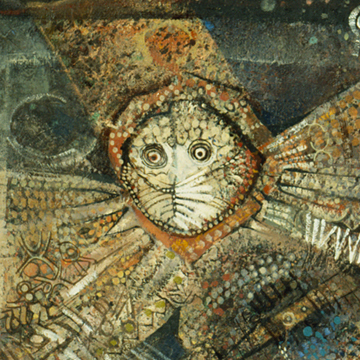 If so, these creatures are the emphasis of the painting. They are the focal points. Perhaps your eyes then move to the space in and around the figures. Describe this space. Do the creatures occupy a space that looks like the surface of the moon? What is along the top of the canvas? Is it a nighttime sky? The sky is black and is covered in a pattern of stars and planets. Look at the tiny planet with a ring around it on the right hand side of the canvas. Does it remind you of any planet in our solar system? Does it remind you of the planet Saturn, perhaps? How would the painting be different if the artist had painted a blue sky and puffy white clouds and had used pastel colors for the bird-like creatures? Would the mood change? How so? Look at the top of this canvas and think about real objects in the sky. Do objects in the sky have patterns of movement? What objects in the sky have patterns of movement? The moon, the planets in our solar system, and the stars have patterns of movement. What do you notice about the pattern of stars in the sky at night? The patterns of stars stay the same, even though they appear to move across the sky nightly. What do they form? They form constellations. Long ago people navigated the seas solely by observing the stars and their constellations. The universe is made up of billions and billions of galaxies, perhaps more, and each galaxy is made up of billions of stars. What we can see with our naked eye is confined to our own galaxy. Our sun is just one star in our galaxy. The Milky Way, the faint shining band that arches across the nighttime sky, is the spiral galaxy that contains our sun. Have you ever looked up at the nighttime sky and located a group of stars called the Big Dipper? Do you know why we call it the Big Dipper? We call it the Big Dipper, because it is in the shape of a large saucepan. 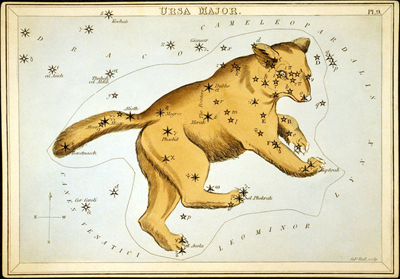 It has seven stars and is part of a large constellation of fifty stars that form the figure of a Great Bear. Why do you think people imagine stars and constellations as saucepans and animals and warriors and then make up stories about them? People imagine pictures and make up stories about everything: stars in the nighttime sky, drifting clouds, leaves floating on the surface of a puddle. We imagine stars and constellations as pictures and make up stories about them to amuse ourselves but also to explain the mysteries of nature, connect to nature, and find our place there. Next time you are out at night, look up at the sky and locate the Big Dipper. With a little imagination, the bend in the handle of the Big Dipper looks like the Fisher’s wounded tail. Or you can imagine you see Mizar—the bright star in the handle of the Big Dipper. You can also see his love—the fainter star next to him. What other objects in the sky have patterns of movement? Does the sun have a pattern of movement? How so? Does the sun rise in the east in the morning, shine overhead at noon, and then set in the west in the evening? It seems like the sun is moving, but is this really so? No, it is the earth that moves. Describe the movement of the earth. It rotates on its axis once every twenty four hours. This is what causes the day and night and makes the sun appear to rise and set. When where you live faces the sun and it is daytime, on the other side of the earth it is nighttime. When it is daytime in Raleigh, North Carolina, for example, it is nighttime in Tokyo, Japan. Finally, what is the pattern of movement of the moon? The moon orbits the earth once every month. Does this explain why the moon looks different at night depending on what day of the month it is? Yes, sometimes the moon and the sun are on the same side of the earth. At this time, the sun’s light on the surface of the moon is completely blocked, and we see a new moon or dark moon. Then as the days continue on, more and more of the illuminated surface of the moon is revealed until the sun and moon are on opposite sides of the earth and we see a full moon. Can you name the lunar phases of the moon? The phases are: new moon (dark moon), waxing crescent (growing crescent), first quarter, waxing gibbous (growing and almost full), full moon, waning gibbous (shrinking away from full), third quarter, waning crescent (shrinking crescent), and new moon. 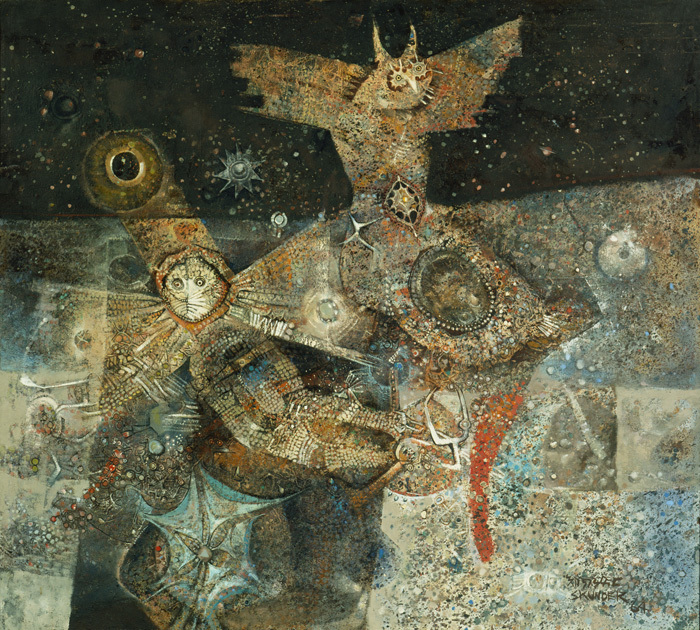 Take one last look at this painting of planets and stars and birdlike spirits. Do you wonder about anything? Do you think the artist is trying to tell us something? Perhaps he is. What is the artist telling you? It may be just me, but the artist seems to have used the parts of art to get across the idea of a wondrous and mysterious universe! Would you like to see Night Flight of Dread and Delight in person? All you have to do is visit the North Carolina Museum of Art in Raleigh, North Carolina. Night Flight of Dread and Delight is in the Modern galleries at the museum. Or perhaps you would like a tour. Tours of the collection are given daily, except for Monday when the museum is closed to the public. If you prefer, you can contact the museum ahead of time and arrange for you and your friends to have a private tour. I’m sure a docent at the museum would be happy to show you and your friends Night Flight of Dread and Delight and many other works of art. Whether you visit the museum on your own or have a tour with a docent, it will be well worth your time!